The Roys Bring Holidays Home with "Bluegrass Kinda Christmas"
Nashville, TN -- The Roys bring the holidays home with their newest CD, Bluegrass Kinda Christmas (Rural Rhythm Records), available now to radio programmers via AirPlay Direct, and to fans by pre-order at Walmart, Amazon and iTunes. The disc will be in stores November 18. The Roys' much-heralded sibling harmonies, spot-on lead vocals and agile musicianship shine a light on Christmas songs both new and old, creating a festive holiday ambience that's apropos for any seasonal celebration. 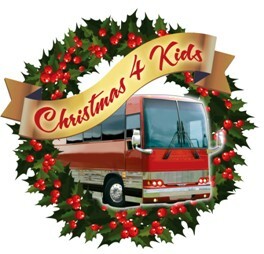 Read more about The Roys Bring Holidays Home with "Bluegrass Kinda Christmas"
Nashville, TN -- Today, this year's official talent lineup was announced for the annual Charlie Daniels & Friends Christmas 4 Kids benefit concert. The Charlie Daniels Band, Phil Vassar, Andy Griggs, Ty Herndon, Jamie O'Neil, The Roys and Ryan Weaver are all scheduled to perform at this year's show to be held at Nashville's historic Ryman Auditorium on Monday, November 24 at 7 PM. Mt. Juliet, TN - In 1982, the late Conway Twitty, with a little help from friends Loretta Lynn and The Oak Ridge Boys, had a vision to help make children who otherwise would be without a Christmas, enjoy the spirit and joyful times of the Holiday. Since that time, then known as Christmas Caravan and now incorporated as Christmas For Kids, the organization has helped brighten thousands of children's lives during the Holidays. 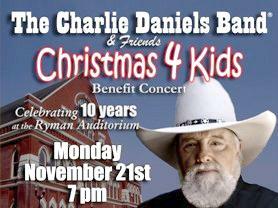 Nashville, TN -- For the 10th Anniversary of the Charlie Daniels Band & Friends Concert to benefit Christmas 4 Kids (a division of Christmas For Kids, Inc.), Grand Ole Opry member and country music legend Charlie Daniels has announced that Phil Vassar and Sawyer Brown will join him on Monday, November 21, 2011 at the Ryman Auditorium in Nashville, Tennessee. Top country artists Colt Ford and Joe Nichols have just been annouced as the latest additions to the line-up for the 10th Anniversary of the Charlie Daniels Band & Friends Concert. Tickets go on sale Friday, October 21st.